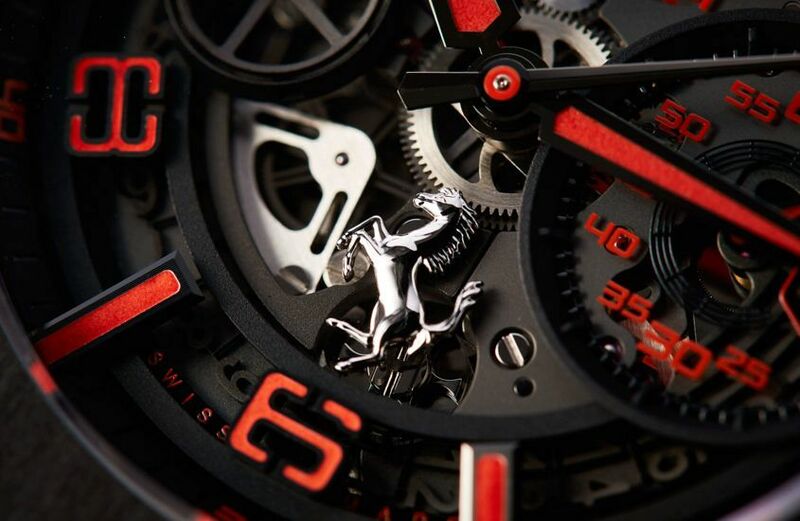 Got a blacked-out 488 rolling in and looking for the perfect watch to match? Read on. 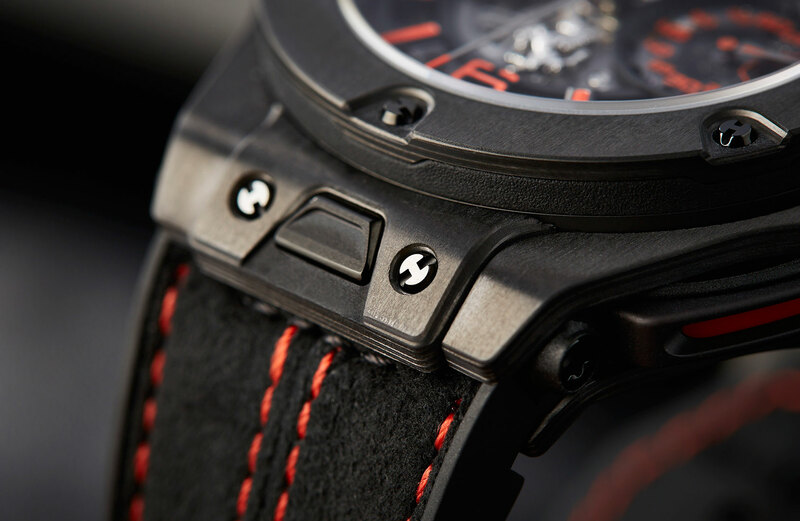 Hublot are masters of both the high-level partnership and the limited edition. Both of these traits are very much to the fore in their freshest round of Ferrari-themed Big Bangs. I recently had the pleasure of spending some time with this not at all under-the-radar carbon version. When the Big Bang was first introduced way back in 2005, it was simultaneously outré and appealing. These days the large and (dare we say) iconic modern sports watch is very much an accepted part of the landscape. But familiarity hasn’t lessened the potency of the Big Bang as, like many great designs, it’s a surprisingly malleable canvas, where almost every single element can be changed, while still managing to be clearly recognisable from 10 paces. These days the large and (dare we say) iconic modern sports watch is very much an accepted part of the landscape. But familiarity hasn’t lessened the potency of the Big Bang. Key to this versatility is the case. 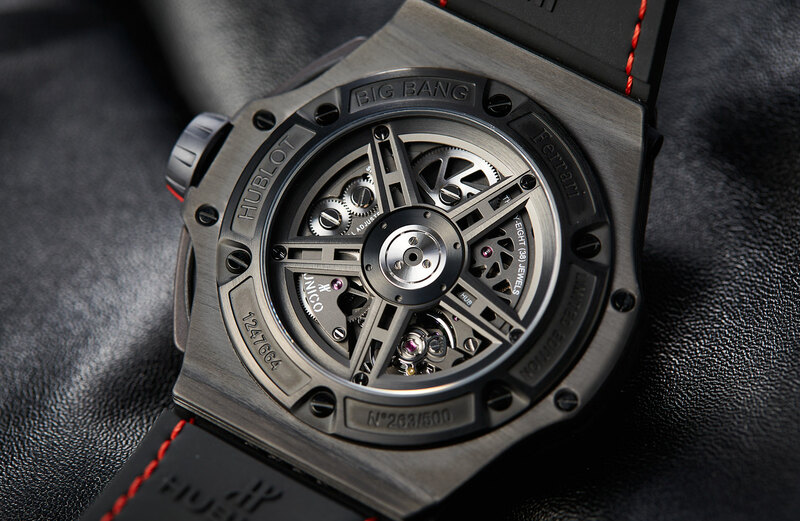 The modular construction and Hublot’s own dedication to their Art of Fusion design approach means that the 45mm case is a plug and play paradise, something this Big Bang Ferrari demonstrates to full effect. While some Hublots revel in contrast and juxtaposition, the case elements of this Ferrari model are all singing from the same hymn book. 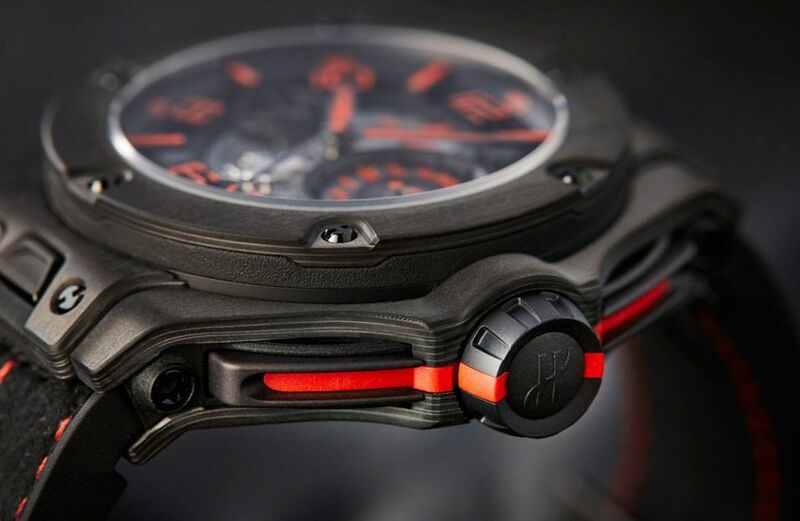 As you’d expect given the watch’s name, carbon is the hero of this watch. And not the crosshatched basketweave version of the material that is on the way out, stylistically speaking, but rather more modern, refined carbon, with a unidirectional brushed finish and a nicely laminated profile that brings to mind blindingly fast yachts or, well, cars. Carbon fibre isn’t the only element of the case that’s looking modern either. 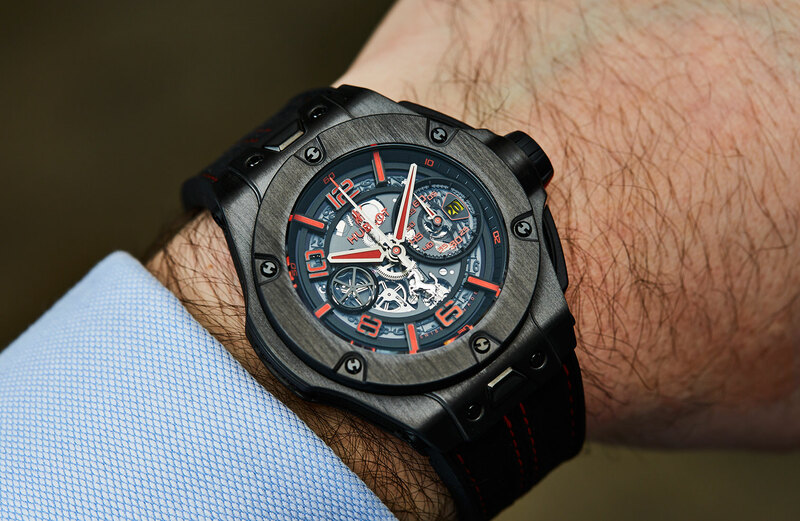 Hublot has given the case a sharp new look, with more fluid, cohesive overall lines in a myriad of well-thought-out details — like the integrated chronograph pushers resembling car pedals, the recessed bezel screws, and a properly large crown, protected with a shroud-like guard. In fact, the crown and pushers are overall my favourite element of the watch, as the twist and lock crown ensures that the line of Ferrari red lines up perfectly, every time. 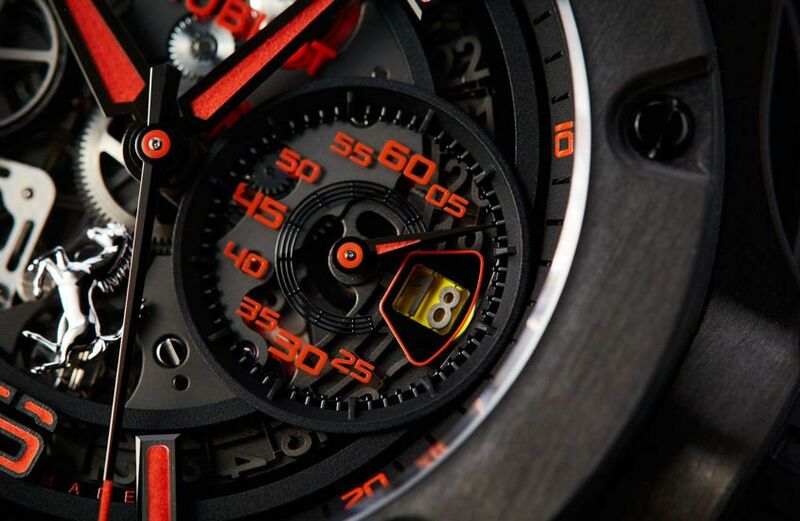 Hublot has a lot of experience working collaboratively, and it really shows. I was really quite taken by this latest evolution of the Big Bang case. And while not everyone is a fan of the Big Bang aesthetic, I think the alterations to this Ferrari version really do pay tribute to the look and aesthetics of the Italian supercars in a meaningful way. 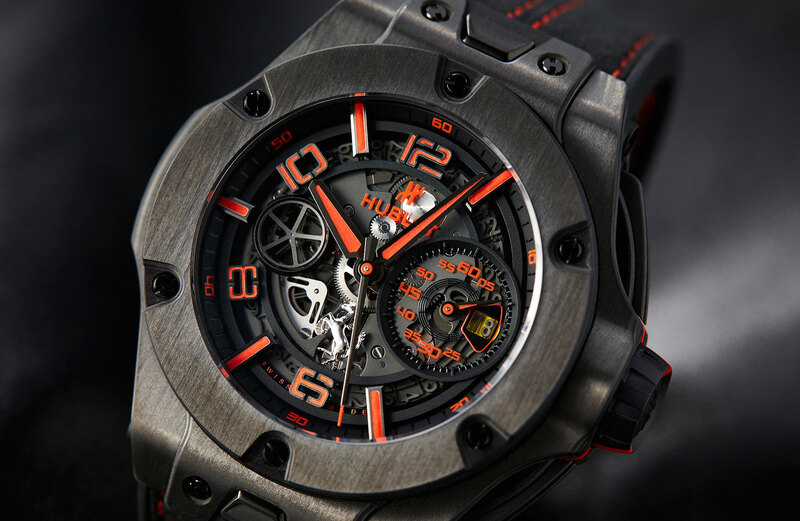 Hublot has a lot of experience working collaboratively, and it really shows. 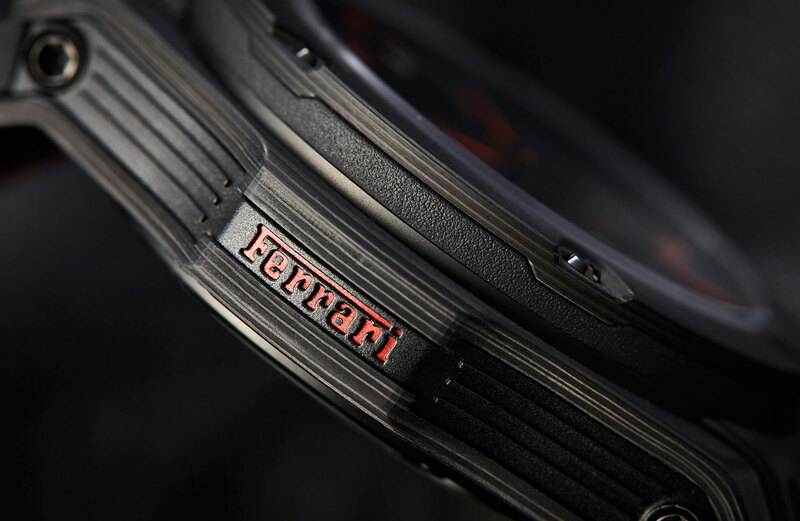 The dial has also been substantially upgraded since the last generation of Ferrari LEs, with the automotive cues more holistically integrated. Of course, there’s the shining, prancing pony (now at six), and the wheel-shaped seconds at nine. But there’s also a redesigned 60-minute chronograph counter which resembles a tachometer, and the well-integrated date pops from a background of bright Ferrari yellow. On top of that, the hands have been redesigned, increasing legibility. Likewise, the numerals have also being refined. Not only are they less blocky, but they’re arranged radially rather than sitting on the same axis. All told, this new dial is a significant improvement on the previous style, and looks especially sharp in this red and black colour scheme. Hublot’s Unico column wheel flyback chronograph movement is, unsurprisingly, the engine powering this Ferrari piece. Actuating the chronograph is a joy thanks to the broad, sporty pushers, and the movement itself is pleasing to look at, with its predominantly black treatment and the particularly industrially engineered looking rotor that takes inspiration from the wheel of a supercar. The automotive links even extend to the strap, which is rubber inlaid with Alcantara, a suede-like substance which you can choose to have your car’s interior decked out in. 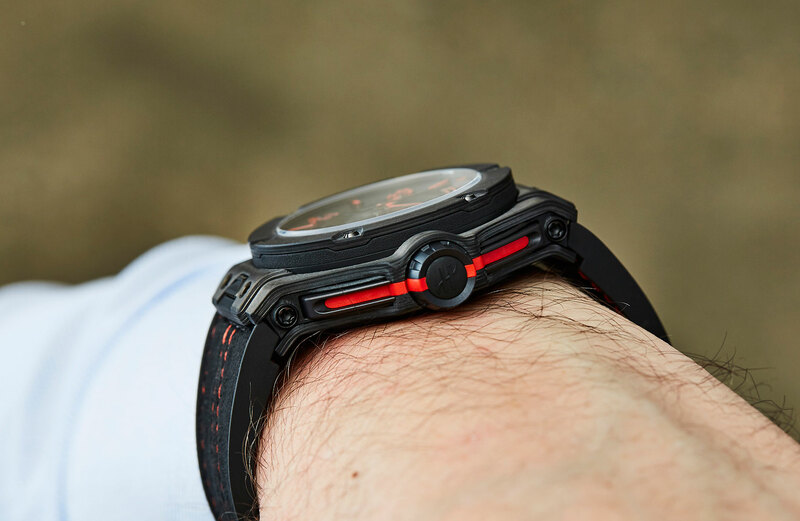 The contrasting stitching continues the red theme of the rest of the watch, and the strap uses Hublot’s neat one-click quick change system. When I first buckled up the deployant I was surprised how light the watch was. With something this big, I expect some heft, but thanks to the carbon fibre construction, any drag on my wrist was greatly diminished. I will say that this is a lot more watch than most cuffs could handle, as it sits high on the wrist. Having said that, I don’t think this watch, or anyone interested in this watch is under any pretence that it’s a demure dress piece. I always enjoy reviewing Hublots. Every single one I’ve spent time with has had a really fun personality. There’s a real performative aspect to these watches that’s refreshing in an often overly stuffy landscape. Hublots speak – unashamedly – to possibility, fantasy and aspiration in a really smart and surprisingly nuanced way. Is Usain Bolt your role model? Hublot’s here to help. Love your Ferrari so much you wish you could be with it all the time? Hublot understands you and has just the watch for you. Are they for everyone? No. But why should they be? Yeah, it goes with my car. Ferrari fans. It would be weird to have this watch if you weren’t. Given how specialised this watch is, not much really. Your mileage may vary on the new numerals or hands, but I like both. For me, I’d prefer to lose the Alcantara in favour of alligator or nubuck strap.